Citroen has unveiled the new C4 Cactus, which packs a long list of revisions to make the hatchback an even more appealing proposition. The big-ticket item here is the brand’s Progressive Hydraulic Cushions (PHC) suspension, a setup that first made its debut on the C5 Aircross. The French carmakers claims a “magic carpet ride” effect with PHC, and the C4 Cactus is the first model in Europe to be fitted with it. Compared to conventional suspension systems that are comprised of a shock absorber, a spring and a mechanical stop, the PHC system adds two hydraulic stops on either side, one for compression, the other for decompression. Unlike a mechanical stop, which absorbs energy but returns a part of it, the hydraulic stop absorbs and dissipates this energy to prevent bouncing. When rolling over light bumps, the spring and shock absorber control vertical movements together with no assistance required from the hydraulic stops. Meanwhile, during major impacts, the spring and shock absorber work together with the hydraulic compression or decompression stops, gradually slowing the movement to avoid jerks at the end of the range. To ensure further comfort, the hatchback also gets Advanced Comfort Seats made of high-density foam to ensure optimal comfort by preventing any subsidence after long stints behind the wheel as well as the ageing of the seat after several years of use. 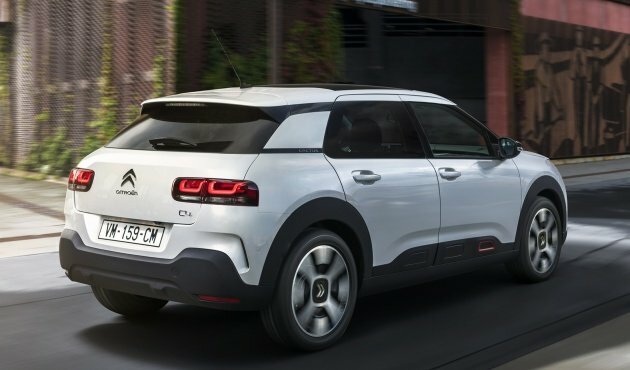 Aside from setting up the C4 Cactus to be “the last word in ultra-comfortable hatchbacks,” Citroen also took the time to tweak the car’s styling a fair bit. Similar to recent Citroen models, the hatchback gains a new, broader front end with LED daytime running lights and grille that stretches across the entire width of the vehicle’s front. The colour-blocking of the main headlight enclosures relative to the bumper has also been down away with, replaced with sharper headlights with gloss black inserts, as well as small side scoops. At the rear, there are new 3D-effect LED taillights with U-shaped graphics within. One of the most recognisable aspects of the C4 Cactus are its Airbumps, which have been redesigned to be significantly smaller and positioned lower on the body. Citroen offers 31 possible exterior combinations courtesy of nine body colours, four Colour Packs and five alloy wheels to choose from. 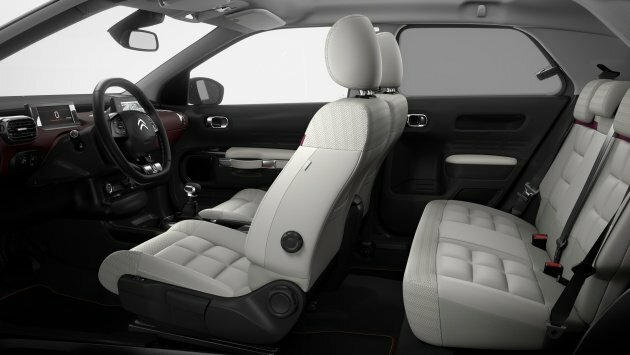 Additionally, the interior can be had in one of five ambiances, with each offering different upholstery and trim bits. On that mention, the cabin is largely unchanged from before, save for the improved NVH thanks to optimised insulation from road and wind noise as well as the from the engine compartment and vehicle floor. Safety and driver assist kit also gets a bump up here, with the addition of autonomous emergency braking, traffic sign recognition and a driver attention warning system. These joins existing functions such as blind spot monitoring, park assist, hill start assist and a rear-view camera. Connectivity functions are accessed via the seven-inch touchscreen mounted on the dashboard, and include smartphone screen mirroring, Connect Nav and Connect Box with the SOS & Assistance Pack. As before, a range of petrol and diesel engines are available for the C4 Cactus, mated to either a six-speed manual, five-speed manual or EAT6 six-speed automatic transmission. On the petrol front, there is a 1.2 litre PureTech mill in 130 PS, 110 PS and 82 PS guises. Diesel options include BlueHDi engines in 100 PS and 120 PS outputs. The hydropneumatic suspension is indeed history, however they announced a while back that they’d be launching this. It’s a new take, simplified and cheaper to produce and maintain. If it is as good… we’ll have to wait and see. Interestingly this system is only to be used on Citroen cars, where it will be an option on most, whereas DS cars won’t get this system. Why…? I prefer the looks of the original C4 Cactus, and the big airbumps were actually useful, as no matter how careless other drivers are, your car wouldn’t get dinged at car parks. You could actually hit the doors with a hammer, and nothing. No problem at all. The smaller and lower mounted airbumps probably mean they are quite useless now. Also it’s a shame they didn’t modify the interior… the screen should at least show a rev meter, especially since many of these are going to be sold with a manual gearbox. With an auto, who cares, but with a manual box? However it’s good that they finally shifted away from that dreadful automated manual (think Savvy!) for automatic gearboxes, and that it has at least some assistance systems. Also I’d be very curious to try the new suspension system. 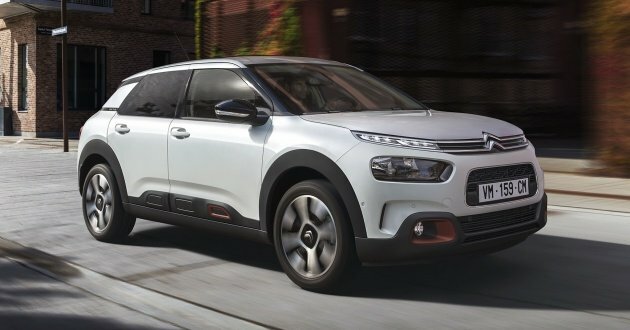 It’s meant to be cheaper to produce and maintain than the old system used on big Citroens, yet as good? We’ll see.